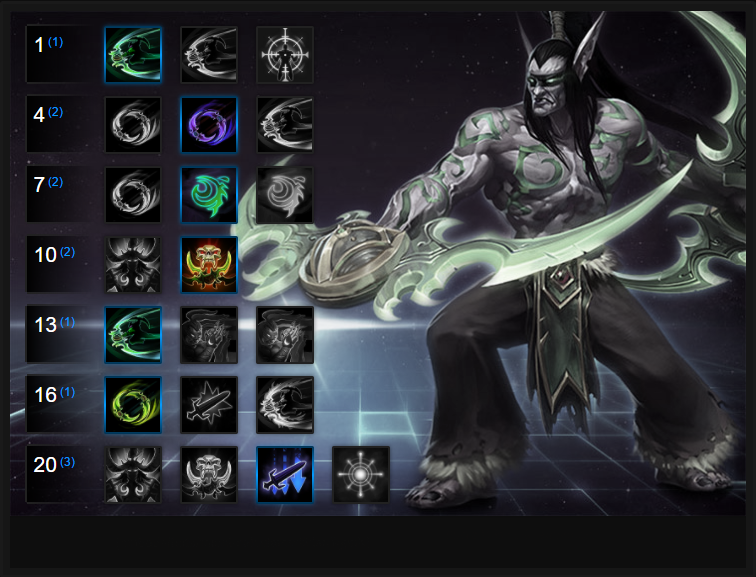 In this Illidan Build Guide, we provide an overview of his strengths, abilities and talents. Illidan is a melee assassin that is capable of focusing on a single target and killing them quickly. He is extremely mobile when chasing and thanks to his ability to leap onto enemies, he can often escape easily by targetting minions or walls. Although he remains popular, he requires a high amount of mechanical skill to get the best out of him. In the right hands he remains a real threat and is regularly picked in the competitive scene. Besides his mobility, Illidan is an incredibly sticky Hero that can relentlessly pursue and attack his enemies. His trait, which allows him to lower his ability cooldowns, also provides invaluable sustain through his ability to block basic attacks. Despite his power if played well, Illidan is countered fairly hard by Heroes who deal burst ability damage. With the right setup around you, Illidan can comfortably snowball. Betrayer’s Thirst (Trait) – As one of the strongest traits in the game, Betrayer's Thirst is key to Illidan's playstyle. Each basic attack heals you for 30% of the damage you deal, while it also reduces the cooldowns of your abilities by 1 second - per hit. Unsurprisingly and to maximize his trait you have to constantly be hitting something. Without doing so, your cooldowns are fairly long and you simply can't survive when diving deep (unless you've a pocket healer with you). I will add that Betrayer's Thirst makes Illidan pretty amazing at soloing just about any camp, including bosses (with the right build). Dive (Q) – Dive can be used on any enemy or neutral target, including structures. This allows you to re-position yourself in very creative ways, and even get over walls if there’s a target on the other side. It can be an initiation tool, although it’s usually better to hold on to it to either chase a fleeing enemy, or get out of a bad situation. Again, Illidan’s mobility is key, so make sure to use this ability wisely. Remember that Dive places you on the opposite side of your target, granting you plenty of time to body block and secure several basic attacks before repeating the process. Diving multiple times against the same target is often key - but remember when to disengage. Sweeping Strike (W) – This is your dash that doesn’t require a target, but should be used much more offensively. In addition to dealing significantly more damage than dive, it also gives a large attack damage boost if you hit at least one enemy. During fights, make sure to use this when available and always ensure you hit someone. I'll also add that despite being an offensive skill, Sweeping Strike should also be used defensively, when neccesary. The fact it doesn't require a target allows you to disengage easily and create space between you and the enemy team. Evasion (E) – A melee Hero who has to dive into the fights needs to have a source of survivability, and this is it. Pop Evasion right as the enemy team tries to focus you, and you’ll be able to take out your target without needing to worry about a lot of that pesky damage. Be aware however that Evasion only provides mitigation against basic attacks. It won't protect you from ability damage such as Kael'thas' Flamestrike or Li Ming's Arcane Orb. If you can, try to only use it when being focused by basic attack heavy Heroes. Metamorphosis (R) – There are multiple uses for this Heroic. Increasing your health pool, dealing extra damage, and even evading abilities due to becoming untargetable while traveling to your destination. It’s usually better to not initiate a fight with Metamorphosis, but to save it to get to the correct target, or dodge an important ability as a fight breaks out. It's also worth ensuring that when you do trigger Matamorphosis (offensively) that you try to hit as many enemies as possible in its AOE. Each Hero hit provides a boost of health that you'll need to survive. The Hunt (R) – If you’re less worried about survivability and more concerned about isolating and taking down a single priority target, The Hunt may be your Heroic of choice. It lacks some of the offensive tools offered by Metamorphosis, but has half the cooldown and can be just what you need to assassinate that one enemy Hero that absolutely has to get taken out. The fact it stuns on arrival for 1 second also ensures it can interrupt key targets/abilities. Illidan is all about damage and Immolation, considering it's a level 1 talent, provides good early pressure. After using Sweeping Strike you'll cause burning, dealing around 50 damage per second, for 4 seconds. It's a considerable amount which scales well as you level up. Alongside your fast basic attacks, it's solid damage that also allows you to clear camps and lanes easier. Friend or Foe allows Illidan to use Dive from 20% further away allowing him to flip onto enemies without needing to be as close (this makes his chase particularly strong). Friend or Foe also allows Illidan to use Dive on allied players, providing a much needed escape route when things get hairy. Thirsting Blade increases the healing from Illidan's basic attacks from 30% to 50%, allowing him to gain much more sustain as long as he's attacking, and while Sweeping Strike's bonus damage is live. Considering Sweeping Strike's improved damage lasts for 3 seconds, with very little cooldown, it's an excellent talent choice (great for also clearing camps). In the current meta, I'd argue The Hunt is much better for Illidan. With larger Battlegrounds, a need to isolate targets and quickly attack someone, The Hunt offers Illidan a swift engage and the opportunity to finish someone off when they're trying to escape. It's also fairly good at allowing Illidan to escape if he quickly targets an enemy unit. Building on Reflexive Block, Nimble Defender grants Illidan 25 armor every time he uses Sweeping Strike, reducing the damage he takes by 25% for 2 seconds. Against any composition, this is a significant amount of mitigation that if timed correctly, ensures your continued survival. Variable: We've mentioned several times that Illidan needs to be able to survive, and Sixth Sense goes a long way towards doing just that against ability heavy teams. Providing a 75% ability damage reduction when you use Evasion, it offers a huge amount of mitigation to any potential damage you might take. A little easier to gaurentee than Fiery Brand (below), Marked for Death causes a spike of damage against a target if you use Dive on them twice, within 10 seconds. Considering Dive has a default cooldown of 6 seconds and each basic attack you do lowers this, it's near impossible not to cast two in succession. Variable: As a sexed up Giant Killer, Fiery Brand allows you to deal 6% of the targets maximum health to them, if you keep hitting them over 4 attacks. It's an enormous damage boost against any Hero but especially double tank compositions. If find you're surviving easy enough, take Nexus Blades. The 20% boost to your damage and attack speed is significant. The slow is also more than welcome and allows you to stick to targets with ease. These Hero Threat Levels (1 being lowest threat and 10 being highest threat) are to help you determine which enemy Heroes can give you a headache. For the Heroes listed here, take extra care as they're particularly dangerous for Illidan. Azmodan: His high health and sustained ability damage will cause you real problems in a very short space of time. Jaina: Illidan can't evade a block of ice, but he somehow dodges bullets. Jaina's Chill and series of abilities that slow your mobility can seriously hurt your ability to fight. Thrall: His superior healing and better health pool make him a problem 1 on 1, especially if he roots you or boots up Wind Fury. Tychus: His grenade combined with Overkill can quickly rip through your health, regardless of if you use Evasion. Varian: Purely because of Colossus Smash, he can ensure he blows your health up when Evasion isn't ready and/or allow his team to with a well placed Charge. This list of tips and tricks are just a handful of things we think will help your Illidan play. We'll continue to add to the list as required and if you have any tips you'd like to share, let us know in the comments below and we'll place them here. 1. If you get focused, you will die almost immediately without Evasion up. Be sure to have it ready against basic attack heavy teams. 2. Don't engage instantly - wait a few seconds before entering the fray and choose your target wisely. 3. Evasion will only mitigate spell damage once you reach level 13 and talent for it. 4. Metamorphosis is a valuable escape tool due to it providing a temporary amount of health (on Hero hit) and an ability to teleport. 5. Remember that you can Dive onto any enemy or structure, including walls. Use this to escape if needed. 6. Try to always focus squishy targets and don't be afraid to Dive head first once a fight has started as it's fairly easy to escape again due to Dive's low cooldown. 7. Remember that basic attacks reduce your ability cooldowns by 1 second. This is key to surviving and staying in combat for Illidan. 8. You don't always have to Dive > Sweeping Strike instantly. Remember that Sweeping Strike when talented boosts your healing and is your only mobility skill outside of Dive. Don't just waste it. 9. Illidan really struggles against anyone that can self heal or who can deal high ability damage quickly. 10. Although Illidan has lots of mitigation and mobility, he can still be focused easily. Don't dive in when the odds are against you - you'll die quickly and your team won't be happy. 11. Don't be afraid to take camps often. You can clear them quickly and help your team pressure lanes.